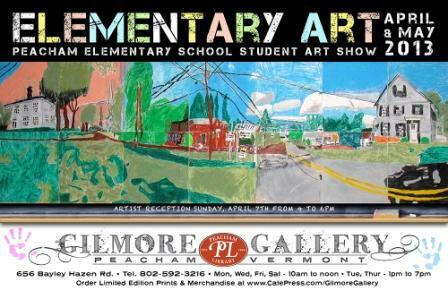 The Gilmore Gallery is proud to feature artwork from students of the Peacham Elementary School for April and May. Thanks to the tireless efforts of art teacher Omri Parsons (along with visiting artists Harley Strader and Jane Woodhouse), Peacham students of all grades have been discovering and developing their talents in a wide variety of media this school year — and in the process, they’re learning to see and interpret their world in ever more creative ways. From preschoolers up to 6th grade, every student has had a hand in this show. We urge you to come in and check it out. An Artists’ Reception with demonstrations was held April 7, 2013.